Way to go Speedy Gregg! 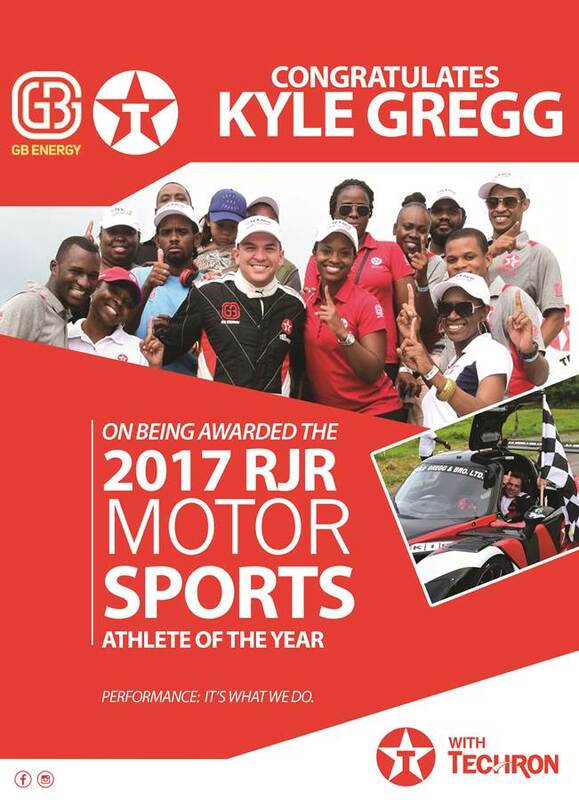 Our beloved race driver Kyle “Speedy” Gregg won RJR Motor Sports Jamaica’s 2017 Athlete of year. We’re very proud of Gregg’s accomplishments and drive. Texaco, operated by GB Energy, has introduced Jamaican drivers to the power of Techron®: an additive technology that works to get the most out of your engine thanks to patented fuel additive technology trusted by motorists, mechanics and auto manufacturers the world over. GB Energy represents the TEXACO brand in Jamaica, which has been present in the country for more than 96 years. After assuming control of operations in November 2012, GB Energy has significantly grown and invested in the Jamaican market. Today GB Energy supplies 67 stations, have increased the number of industrial accounts as well as our market share in Aviation fueling supply. GB Energy is also present in one terminal in the Jamaican market. GB Energy Jamaica has strong ties to the community with an active participation in the American Chamber of Commerce, the Private Sector Organization and the Jamaican Chamber of Commerce.